For the past 9 months we’ve been circling around a lot of the same states, which makes this our first official “new” state since that single night back in Nebraska last July. I put new in quotes because while we have both spent some time in New Mexico, we’ve never been here together, and we’ve never been here with the Airstream, which makes it a “new” state. 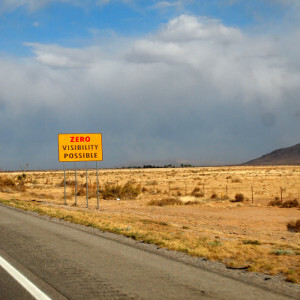 New Mexico is also our 20th state since leaving Vermont back in June of 2012. We have a long way to go if we’re going to hit them all. We’ve been here less than a week, but already I’ve developed a few ideas about New Mexico. It’s very possible that these only apply to the area where we are right now. But for now here are my initial impressions. It will be interesting to see how many of these hold true at the end of our three month stay. I could do without the wind or crappy cell service, but I really hope the last one remains true throughout the whole state. We just purchased a state park pass (more on that at the end of the post), and plan to spend the next three months staying almost exclusively at state parks. If they are all like our first stop at the City of Rocks State Park then we are in for a treat. 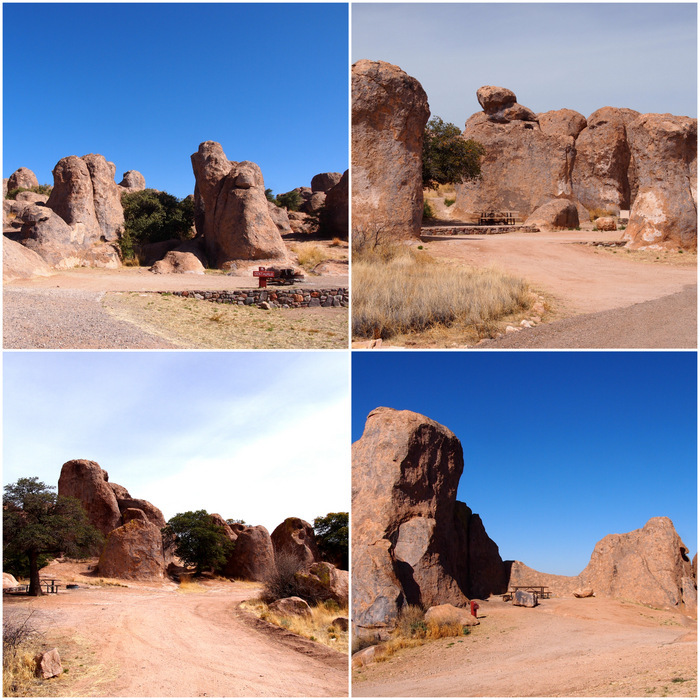 City of Rocks is located in southwest New Mexico between Deming and Silver City. As we drove north from Deming through miles of flat, grass covered meadows, I couldn’t help but wonder, where are the rocks? And then, Bam! We rolled over the crest of hill and there it was. 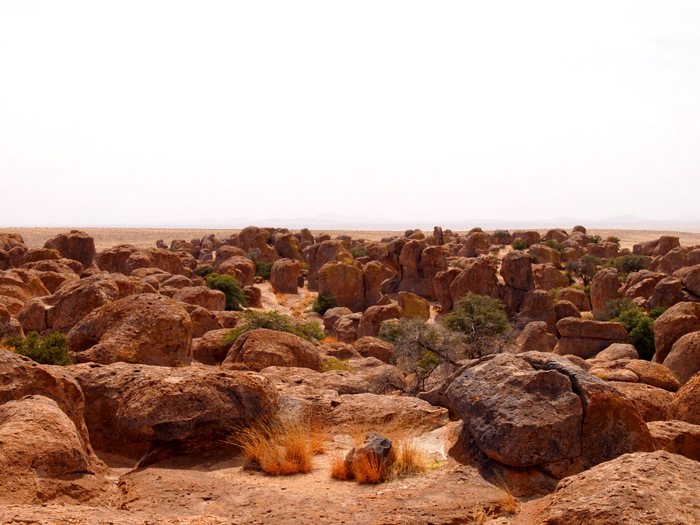 A city of rocks amid a sea of grass. According to the video we watched at the visitor center, the city as we know it today formed during a volcanic eruption 34.9 million years ago. 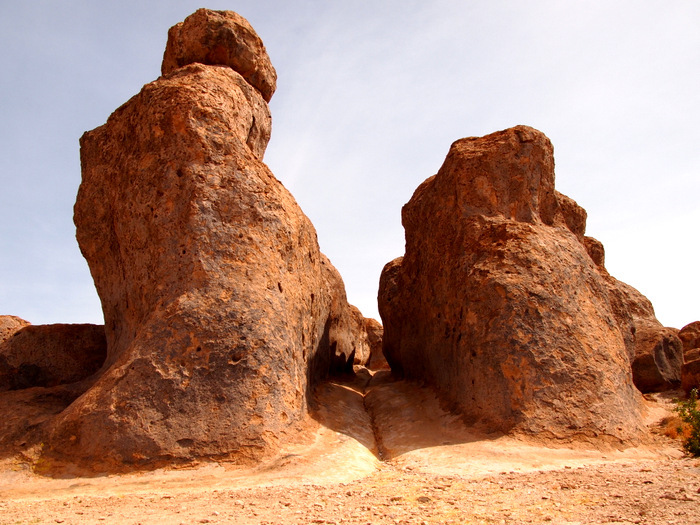 Over the years the volcanic matter cooled and formed a layer of rock the cracked and eroded leaving behind the large rock pinnacles and boulders separated by paths (or city streets) that we see today. One of the streets – let’s call this one Boulder Ave. Upon arrival we circled around a few times looking for a spot where we would fit, and at least have a shot at getting level. Of the 52 sites, 37 of them are first-come-first-serve, no hook-up sites. There is also a small loop of 5 dry sites that you can reserve, as well as 10 reservable sites with hook-ups. 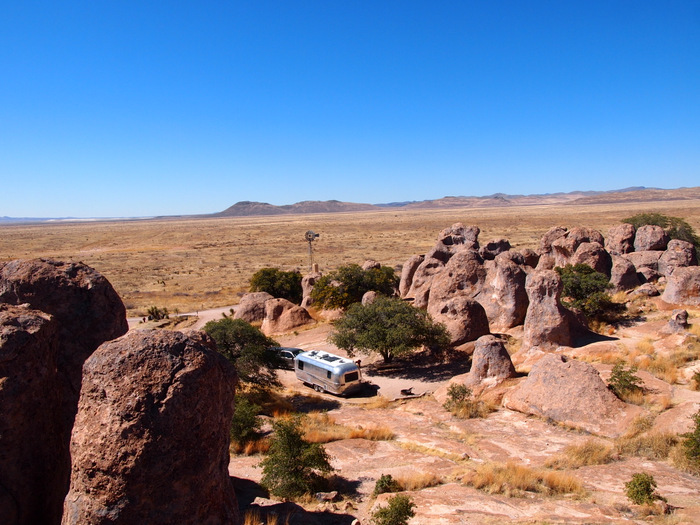 The dry camping sites are all tucked in the rocks surrounded by cool backdrops and rock formations. Unfortunately, many of them are either too small, too slanted, or too awkward shaped for the average size RV to fit in. That’s not to say it’s impossible to find a spot, because many are suited for RVs, but we noticed that most of the really big RVs are in the hook-ups area. We got lucky and snagged a really cool looking, really private spot on the west side of the park. We had a long private driveway, two nice evergreen Live Oak Trees with glossy green leaves, a huge siting area, and a gigantic playground of rocks in our back yard. Because we were facing west we also had some awesome sunset views. It seemed perfect. Until it wasn’t. The problem arose on Tuesday morning when the internet slowed to a crawl. Since we need the Internet to pay the bills, a usable cell signal is required, and for some reason that wasn’t happening on Tuesday morning. Up until then we had a great 3G signal. No idea what happened to it that morning. The strange part was that we still had a strong signal, but for some reason our mifi device refused to connect and stay connected. We managed to muddle through the day with the slow connection, and after work Tim drove around the campground with the mifi and his laptop trying to find a better signal. The only place he had luck was over by the visitor center. The next day there was no change. Around noon we decided it wasn’t going to get better and the only thing to do was leave. So after work we packed up, hitched up and started to head out. At the last minute we decided to check out site #1 near the visitor center to see what we could get (when tim checked the previous day it was occupied). Well lucky us, the site was empty…and we got a 4G LTE signal! As of today (Thursday) the connection is holding up fairly well. It has dropped several times, but so far- cross fingers- it’s come back every time. This site is not quite as perfect as the last one. We still have some cool rocks nearby, but our front door view faces the visitor center and the entry road, so we see everyone as they drive in and out of the campground. It will do for the next couple days though, and we are very relieved that we didn’t have to move to another campground yet. One of the reasons that we want to stick around is because we plan on checking out Silver City and Pinos Altos this weekend, and right now we’re in the perfect position to visit both. Okay, on to the promised info about the New Mexico State Park Pass. For a fee of $225 (or $180 if you are a resident) you can get a one year state park camping pass. With this pass you get $10 off per night on all camping fees. That means if you are planning to spend more than 22 days in a year period at any New Mexico state park this pass is a must have. For people like us, who plan to spend 3+ months here it is a huge money saver. And with 36 parks spread across the state we will have no problem finding a park anywhere we want to visit in New Mexico. The best part is that the camping fees are already incredibly low. $10 for dry camping, $14 for water & electric, and $18 for full hookups. Crazy right? That means here at the City of Rocks our site would be $10/night, but with the pass it’s zero! Soooo, because I am a little dorky when it comes to stuff like this, I made myself a spreadsheet to compare what we would be paying without the pass, versus what we are paying with the pass. When we leave the state at the end of June it will be interesting to see just how much we saved. And of course I’m sharing it with you. For the fist couple of weeks the per day fee with the pass will be higher than without, but after that just watch the savings roll in. We love New Mexico and have spent a lot of time there—and plan to spend a lot more time there now that we’re full timing. 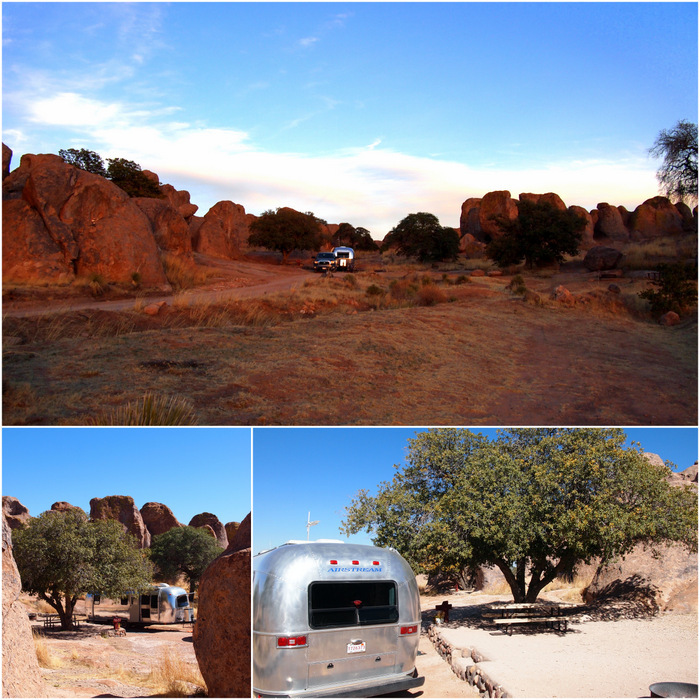 We’ve liked all of the NM state parks we’ve stayed in, and it’s windy mostly in the spring. 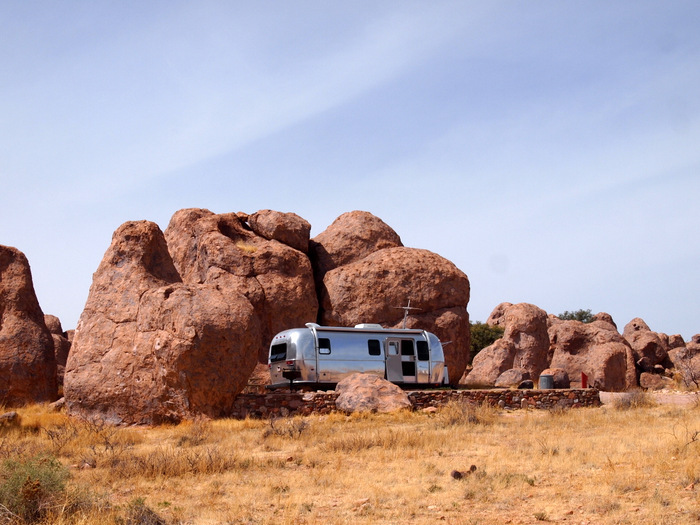 You’re right, cell service is iffy in the boonies of NM—glad you could get connected and remain at City of Rocks. Such a pretty spot! Have fun in Silver City! A lot of people did warn us about this wind. Already we really love it here and are glad that we decided to spend such a long time exploring the state. Great idea about State Parks pass. We had heard it to be a good deal. Nice to know the break even point. We will be in NM for most of April and City of Rocks one of the places. Cell service in more remote locations is a challenge at times. Sigh. Bummer. Glad you found a spot. We will try for that one when we arrive in a couple weeks. Windy this time of year, especially near the continental divide at higher elevations. Silver City is small and downtown pretty neat. We were there last spring. Check out the homemade tamales and tortillas in a little place called “Masa y Mas” (on Yelp) in downtown Silver City. On north end of main drag (bullard street) just or near that “T” a block or block and half south of the “T” Can’t remember name but wow. Can’t wait to visit again soon. Maybe we will see you somewhere around the state next month! If you do make it the City of Rocks the east side of the campground seems to have better cell service. Also, if you want one of the hook-ups sites I would look into reserving sooner than later. Although in my opinion the dry camping sites are much nicer! 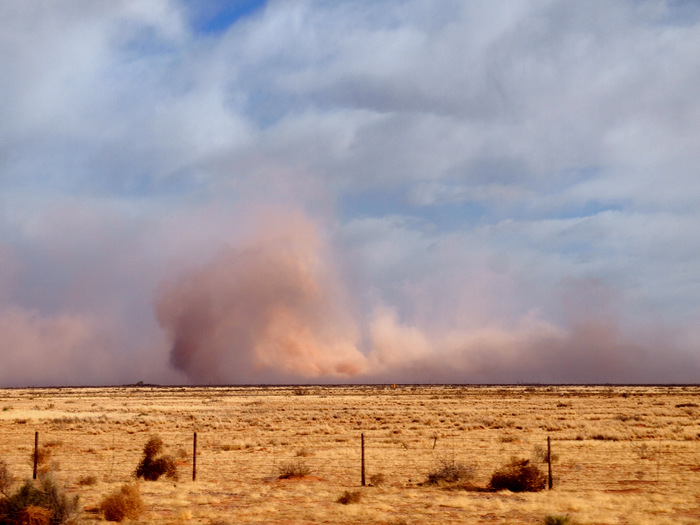 We loved all the NM state parks, but you’re right about the wind (never stops in spring)! City of Rocks was our absolute fav, but we also really liked Elephant Butte, Oliver Lee and Bottomless Lakes. I’ll be looking forward to your updates! All three that you mentioned are on our route, plus a bunch more! We stayed in the hook-up area, but were dying for some of those dry camping spots! We also looked at the State Parks pass, but were only going to be in NM for about 10 days so it wasn’t worth it at that point. Can’t wait to see what your spreadsheet does. :) Also – Texas has a great state parks pass too. Totally worth buying as it covers the entrance fees (they charge between $5-$7 per person per day even when you are camping). Ooohh…good info about the Texas state park pass. We’ll be there next fall and will definitely look into it! 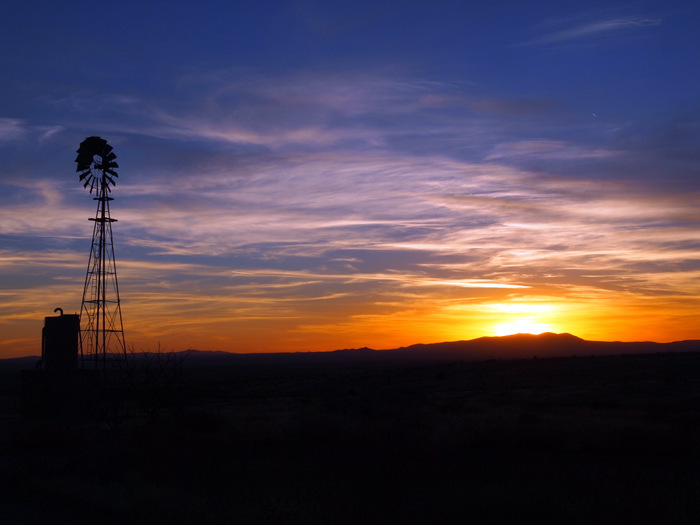 You’re right on all counts with your impressions of New Mexico! Nice going. We had some issues with cell service at state parks — because they are often remote, the signals can be sketchy (or non existent!). No chance of a signal at the state park here near Santa Fe (Hyde SP), but Leasburg Dam SP was fine for us (and has great hiking nearby). Love that you guys are here, and looking forward to reconnecting! BTW, continue to love your blog — your posts from the past few weeks have been some of my favorites ever. Glad to hear I got the state all figured out in less than a week :) We’re headed to Leasburg Dam in the week after next so glad to hear cell service is good there. 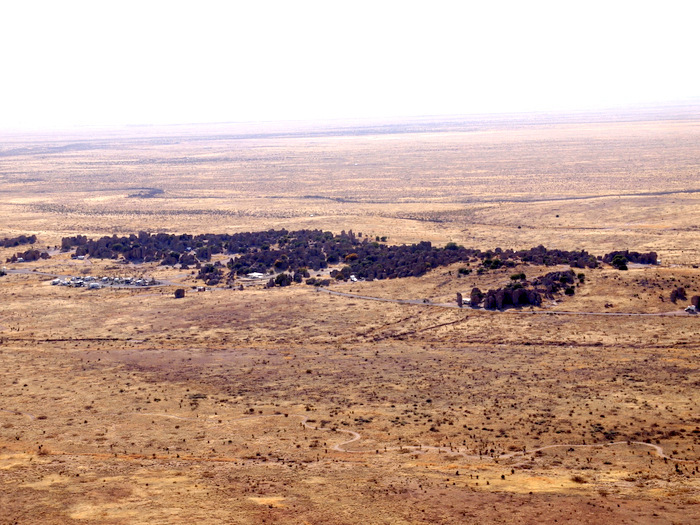 Sounds like we’ll need to find an alternative to the state park near Santa Fe though. We’re also very excited to reconnect with you guys! Thanks for the nice comments about the blog. It’s always nice to hear that others enjoy my posts! We bought a New Mexico State Park Pass last spring and stayed at Bottomless Lakes, Fort Sumner, Storrie, and Santa Rosa. We had to make a trip back to Maryland last summer but we headed back to New Mexico as soon as we could. Since then we’ve stayed at Ute, Storrie again, Elephant Butte and Caballo Lake. We were planning to head to Arizona when it started getting too cold in New Mexico but it was so mild here this winter we just stayed. We’ve been going back and forth between Elephant Butte and Caballo Lake all winter. We love it here. 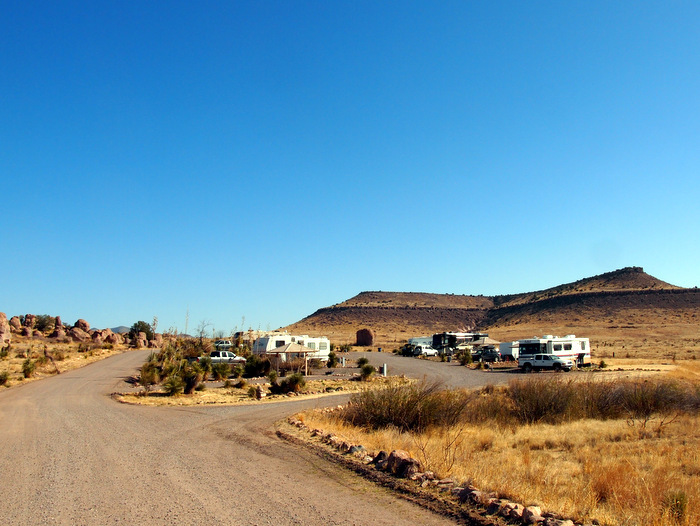 If you go to Elephant Butte, there is a campground about 10 miles north of the main campground called Monticello South. It is much nicer than the main campground if you like beautiful views and privacy. We’re not really set up for dry camping so we usually get an electric site. That’s one weird thing we’ve learned about the NMSParks-different campgrounds are better for some types of camping than others so my tips might apply more for the electric sites than dry camping. Andy Baird at TRavels With Andy and Barb at Me and my Dog and my Rv are both dry campers who have blogs with LOTS of info about the New Mexico parks. Andy even has a New Mexico State Park app you can buy for your phone. It mostly just has the info you can get from the NMSP site but it has a few features (like the weather) that I really like. RVSue spent a few months in NMSParks when she was first starting out so check her blog, too, for info. If you are heading to Bottomless Lakes this spring, you might want to time your trip for early May. Roswell has a really nice balloon festival around that time. We went last year and loved it! 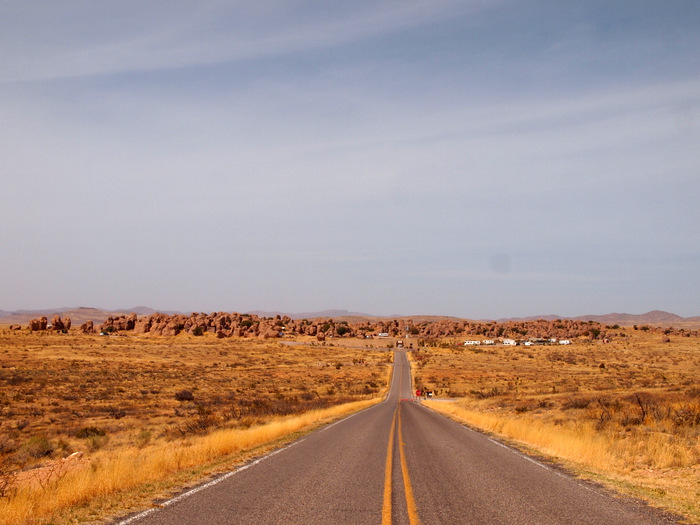 From there, Fort Sumner is a nice “next stop” but there is a section of road between the two that is HORRIBLE. Just a head’s up. This is already too long (sorry about that) but if you want more tips just ask. We’ve visited several other NM state parks, too, but haven’t stayed in them. (Sugarite, Morphy Lake, Villanueva.) We’re still doing our Elephant Butte/Caballo switch off but Caballo is getting way too crowded so we’ll probably head out soon. We might head back to Bottomless for the Balloon festival. And yeah, the wind…aargh. It wasn’t bad at all this winter but it has definitely kicked up the past two weeks. We definitely plan our travel days around it. Wow! Thanks so much for all the useful information. I’ll definitely check out the two blogs you recommended. Most of the parks you mentioned are ones we plan to visit. In fact, we need to make our way to Albuquerque so Tim can attend a work event in mid-April and plan to stop at Cabello Lake and then Elephant Butte. Cabello will be the week of April 6th and Elephant Butte the week of April 13th. Please let us know if you’re still in the area and maybe we can meet up! 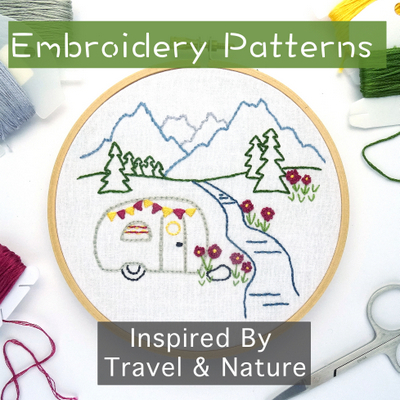 I just looked at the photos on your blog and they both look like gorgeous campgrounds. We are planning to visit Bottomless Lakes. I’ll have to look into the ballon festival and see if we can time our visit to coincide. I can see how it would be hard to find a dry camping spot here. Any rig over 30′ has pretty limited options. Glad you at least got to stay 2 days. 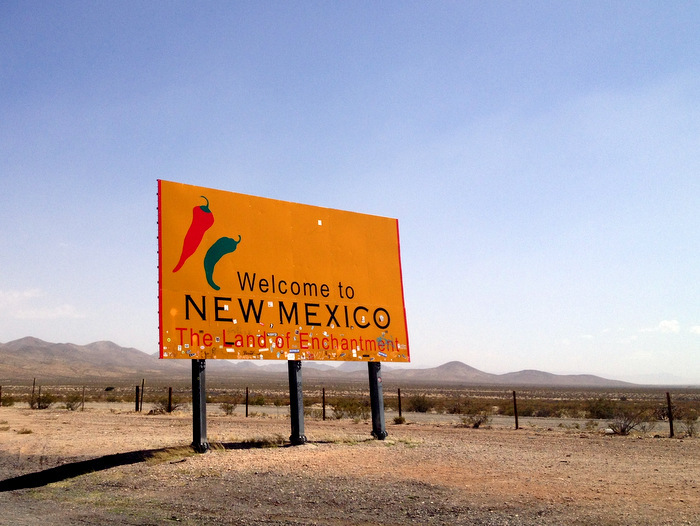 We haven’t spent much time in New Mexico….yet. Looking forward to your adventures there. You sure know how to pick beautiful spots to call home!